Did Hitler die in a bunker or is he celebrating his 78th birthday today and living in exile in Hertfordshire...? 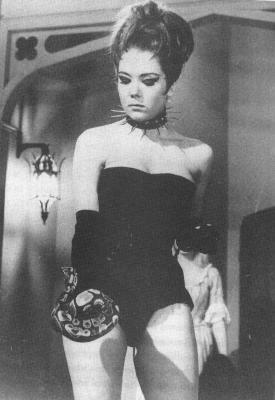 Emma Peel - elected dictator of Great Britain! I first met Adolf Hitler when I was a young captain in 1945. He was dead. What can I possibly add to the mountains of material already written about The Avengers? Bugger all, to be honest. Though, if you want to read a decent analysis of the series, I can point you in the direction of a very fine book: James Chapman's Saints & Avengers: British Adventure Series of the 1960s (IB Tauris, London, 2002). The show was, as you'll no doubt already know, a fantastically stylish pop-art self-referential post-modern piss-take of the entire spy genre starring the gorgeous Patrick Macnee alongside a string of equally lovely young ladies. My own favourite was Linda Thorson, but the popular choice was Diana Rigg as Emma Peel, and it's her who stars in this novel.